Extra-Large Shock Absorbers Keep Ship Lock Intact Despite Collision – ACE Controls Inc.
A wooden safety beam, which helps sailors maneuver their ships into a ship lock in the Netherlands, recently cracked after a cargo ship had collided with it. But despite some splintered wood, the overall structure survived the accident—thanks to some extra-large ACE shock absorbers that had been custom-designed and installed on the lock gate as a safety measure. 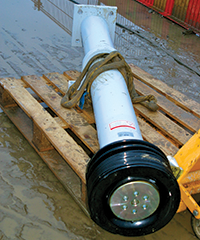 Here’s a look at how the oversized safety shock absorbers—capable of stopping 4,000-ton cargo ships—are key to protecting the lock gate and ensuring the safety of the ships passing through. During the design phase of the ship lock system, Dutch construction and steel company Mourik Lumburg had to take into account the fact that ships may touch the safety beam while navigating into the lock. The action resembles the way a car, as its driver navigates a tight parking spot, might tap the car next to it. But with loaded vessels weighing up to 4 million kg and traveling at 0.5-m/s speeds, the gate would need to withstand a considerable amount of force. Mourik technical experts needed large, heavy-duty shock absorbers that could protect the gate. They approached ACE Controls for a solution. ACE technical experts calculated that the shock absorbers would need to withstand 500,000 Nm of energy—requiring a customized design. Weighing in at 320 kg, these special oversized shock absorbers feature a length of 2,649 mm, outer diameter of 200 mm and stroke of 800 mm. After the collision in the Netherlands ship lock, engineers installed a new beam on the gate—a process that required temporary disassembly of the shock absorbers. During this process, ACE technical experts were on hand to provide the repair team with all the necessary support on how to remove and then reinstall the dampers. Thanks to these extra-large components, the ACE and Mourik teams are confident the ship lock will continue to operate safely for many more years.